It was yet another visit to a market that made me discover this gem of a restaurant. When I told my friend Carmen that I wanted to visit the Medellin market, she offered to accompany us. 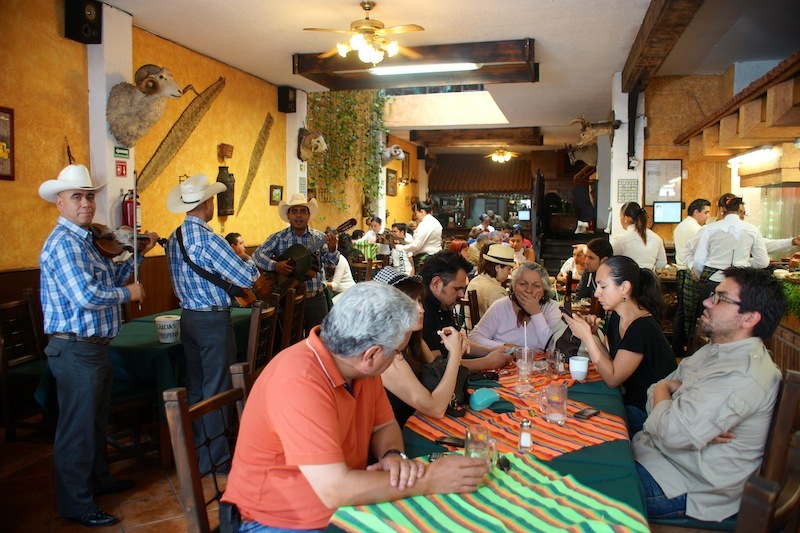 However, she told us we would have to combine it with a tasting of the famous “barbacoa” or barbecue of the Hidalguense, a restaurant at walking distance of the market. She couldn’t join us for lunch but she insisted we had to go and try the food. 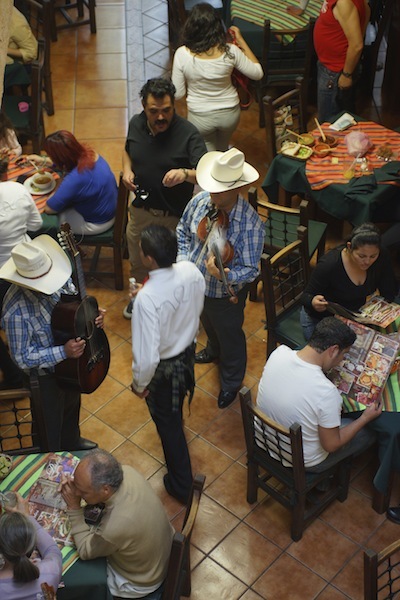 The owners of the Hidalguense restaurant, husband and wife are from the state of Hidalgo. They have been in this business for over 40 years but only decided to open a restaurant in the capital 19 years ago. 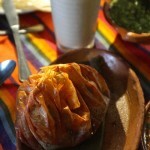 Apart from the well appreciated lamb “barbacoa”, the restaurant also offers a wide range of dishes from the state of Hidalgo. The richness of the cuisine “Hidalguense” mixed with the traditional methods of cooking still in use today, results in a special combination of flavours, spices, smells and sometimes exotic produce. This is the case with the several types of insects on the menu (check my post Eating insects at San Juan Market if you want to know more about the type of insects you can find at the restaurant) as well as unusual meat like squirrel and opossum. The lamb is very fresh, tender and is brought from the owners 500 head ovine ranch. As the restaurant is only open every friday, saturday and sunday from 7 am to 6 pm the animals are usually killed every thursday very early in the morning. The meat is then cleaned, cut and prepared for cooking. At around 10 am it goes inside the preheated underground pit ovens, seasoned with coarse salt and wrapped in manguey or Agave leafs. It will be slowly cooked on top of aged oak wood and it will only be ready at 2 am in the morning on friday, when it is packed and ready to go to the restaurant. That is the secret of the wonderful lamb “barbacoa”. The tenderness is really amazing. When you arrive at the restaurant, you are pleasantly surprised. The atmosphere is warm, relaxed and often they have live music. There are two floors and if you want to be downstairs, on the main one, you need to arrive early. We were already a bit late so sat upstairs which is also nice and quieter if you have children. There is even a small playground for them. We decided to ask the waiter for advice on the different dishes and were very happy with the suggestions. This is what we started with. 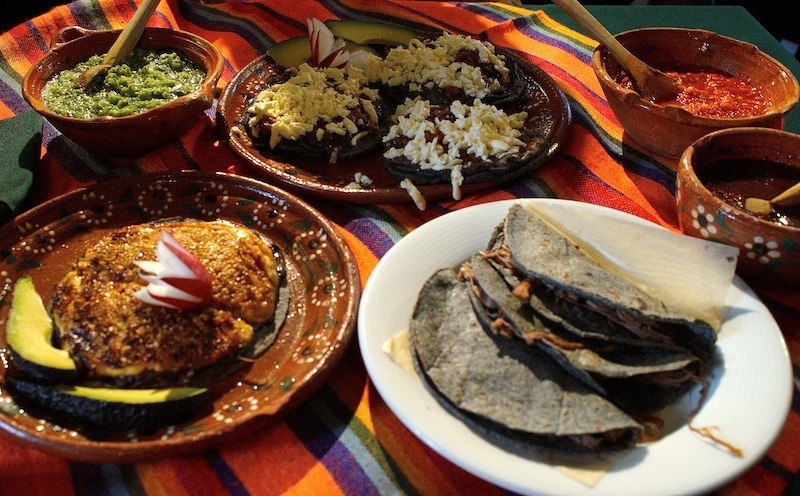 Front row on the left, “Queso asado huasteco” or grilled huasteco cheese with herbs. 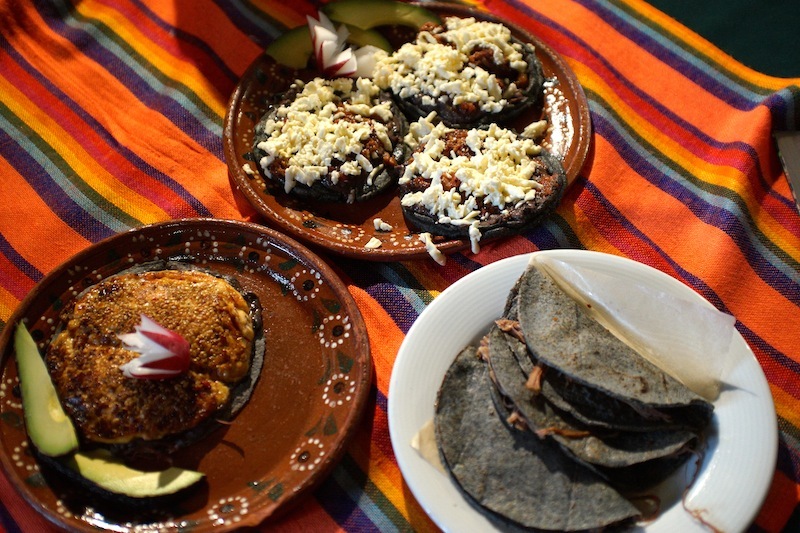 On the right the famous “Tacos de Barbacoa” or Lamb barbecue Tacos with the healthier blue tortillas made with blue corn. Back row was the “sopes huastecos” which are a kind of smaller blue tortillas with a bean paste base, chicken or pork (we had chicken) in a tomato sauce and “Panela” cheese spread over it. All this came with three kinds of sauces, in the small bowls from left to right: a “salsa verde”, the green one, usually made of green tomatoes and green chiles. 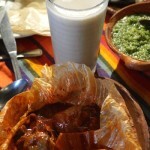 A so called “Salsa Borracha” or drunk sauce, which is usually made with red chiles like “pasilla” and with “pulque” which gives it its alcoholic content. Finally, the “salsa Macha” which in this case is a creation of the owner who uses chiles de arbol, chiltepin, chile serrano and tomato. It is extremely spicy but the richness and combination of flavors is unique. 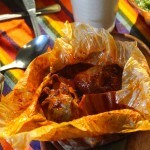 Then we decided to taste a “Mixiote de Pollo” or chicken cooked with chiles and herbs wrapped in the outer skin of the leaves of the manguey or agave that gives it a special flavor. As drinks we chose for me the typical “Agua de Horchata” that is a sweet, milky drink with rice and cinnamon, you can see it in the previous pictures behind the mixiote. My husband chose “Pulque guanabano”. Pulque is a pre-hispanic alcoholic beverage that is made with the fermented sap of the manguey or agave plant. It is many times mixed with different fruits. 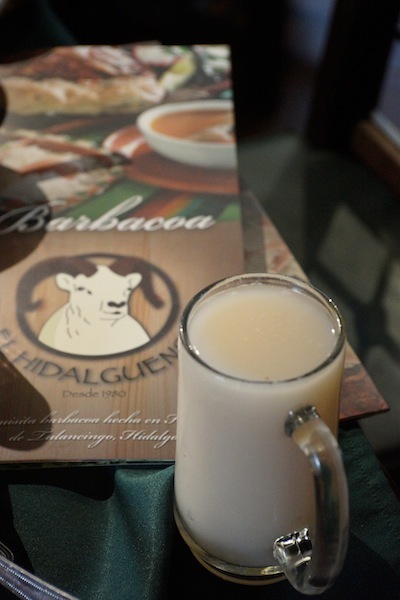 The guanabana or Soursop gave the pulque a fresh, fruity taste with a hint of sweetness. For dessert we shared a “Pan de Elote” with Rompope. It was very nice and we were so distracted talking about how great the food was that we ate it all before we could take a picture. 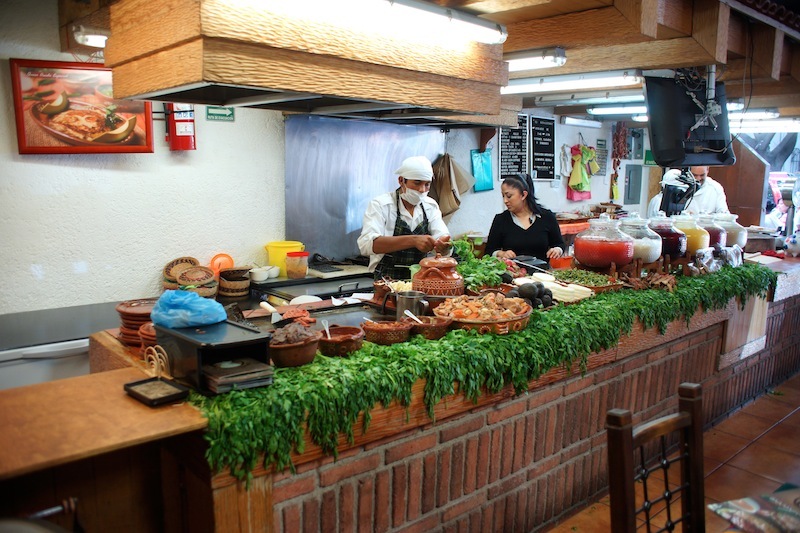 I highly recommend this Mexican restaurant and if you enjoy markets as much as me, you can also combine it with the Medellin market.